Run for charity and you can make a big difference to children’s lives in Zambia. Whether you conquer a 10k, master a marathon or triumph over a triathalon, charity runs are a great way to push yourself for a good cause. 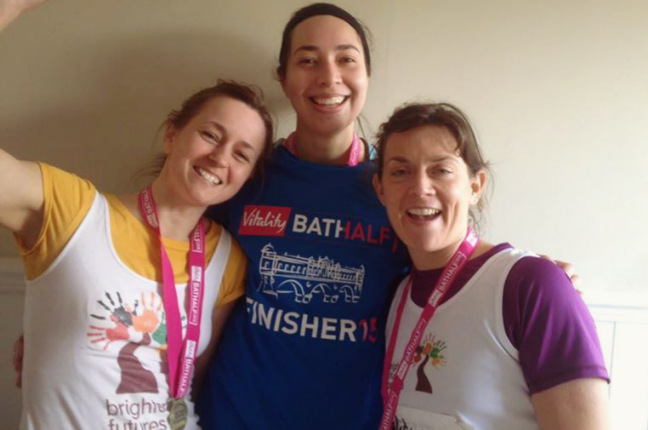 Just ask Paola and her friends Katie and Alice (above) who beat the Bath Half Marathon 2015. If I run for charity, how will my donations make a difference? Your donations will make a huge difference because everyone at Brighter Futures Zambia is a volunteer. Finn (left) ran the Edinburgh Marathon 2015 and Alice (right) the Bristol Half Marathon 2014. Between them, they raised £1,500 to help orphaned children in Zambia and their carers. Who’ll sponsor my run for charity? You’d be surprised about how many friends and family members will donate to your charity run – just look at the word cloud (below) from people who donated to Alice’s Run. You could also have little events to help you reach your target – you could put on a bake sale, a tuck-shop at work or a non-school uniform day at your local school. There’s lots of different ways to reach your target and we’re always happy to help with tips, so get in touch below for more info.